Once again, my fellow SWTOR fans and spacers, it’s time for your weekly dose of Force Lore, on Corellian Run Radio. This article is late, yes, I know. I have to apologize for being absent last week due to some unforeseen circumstances. Life events happen to occur at bad times and slow you down. I didn’t anticipate the latest one and it interrupted plans to have this out to you last week. But onward and upward, as I always say. Today’s article is a special request from a reader who was curious about the counterpart to the Republic’s Flashpoint, The Esseles. So, without further ado, we’re jumping in to the Black Talon, the first Flashpoint that Empire players get to encounter. Buckle up and make the jump! You have to admit that your opening levels in Star Wars: The Old Republic is pretty standard to other MMOs. The flavor of Star Wars is added with the references to the Force and the familiar technology from the SW universe. Lightsabers, droids, blasters… Strip it of this, and the game is just a Sci-fi genre MMO. If you don’t have knowledge of Star Wars, you may not have an idea of what you are experiencing first-hand. Since the starting/origin worlds aren’t featured in the movies, these are brand new environments to explore for new people coming into Star Wars for the first time. Even once you move on past these starting points, the backdrops are still new and fresh, easily added into any other space-based game. 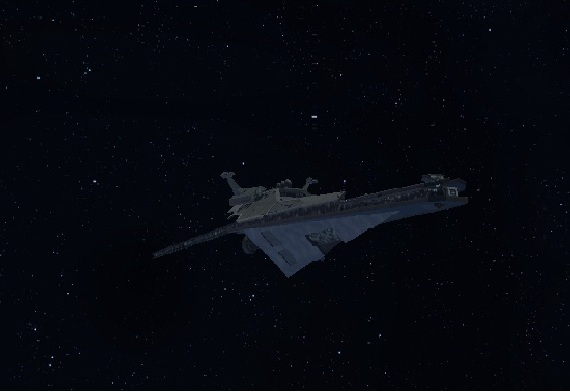 Once I landed on the Vaikan Spacedock at the Imperial Fleet and got the quest for the Black Talon, I was beginning to feel the emersion into Star Wars even more than I did on Korriban or Hutta. Finding my friends online, we quickly grouped up to hitch a ride to Dromund Kaas aboard the Black Talon. Starting into this instanced area, I started to have visions of Han and Luke storming the corridors of the Death Star. Thoughts of glory abounded in my mind – The mighty Sith Warrior leading Imperial forces to a victory over the Republic scum. The Black Talon, a Gage-class transport, is a pretty standard design, Imperial vessel. Much like it’s cousin, the Terminus-Class destroyer, the BT shares a classic wedge design which has been a part of Star Wars since the original film debuted in the 1970’s. The BT is built on a similar super-structure as the Terminus, but is stripped of most of the turbolasers in favor of greater cargo capacity and troop barracks. The ship’s primary job is to deliver cargo and troops to operational fronts safely. Once you get on board the Black Talon, you’ll find out that there’s a certain “lack of motivation” concerning the captain of the vessel. You receive orders from Moff Kilran to operate under his authority, take control of the Black Talon, and to pursue the damaged Republic cruiser, the Brentaal Star, a Thranta-class cruiser. Onboard the Republic ship is a VIP of particular interest to the Empire and Kilran wants you to get him. Your first task is to persuade the BT’s commanding officer, Captain Revinal Orzik, to follow orders and over-take the Star, or “relieve him of command” and proceed with the mission yourself. The Empire demands absolute, unwavering loyalty and obedience. If an individual cannot live up to this standard, then the usual punishment is death. I have a feeling that most of us have put the good captain to death rather than influencing him to follow orders. The path you choose will influence what you initially have to face, going into the following battles. Killing Captain Orzik will lead you to a confrontation with the first of three to four boss encounters while completing this Flashpoint. This is a prime example of how your choices in the dialogue parts of the flashpoint influence events. I say three to four encounters because you can skip the second to last boss if you so desire. 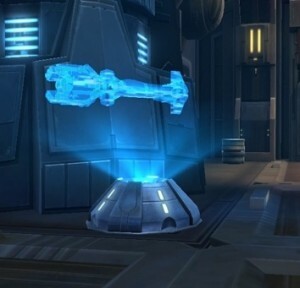 The first up is the GXR-5 Sabotage Droid that is sent over to the BT by the enemy. A Class-Four Droid, the GXR-5 is a specialty unit designed for exactly what it’s name implies, sabotage. It’s also geared for combat. Once the Droid and “his” buddies are taken care of, it’s time to move on to the next encounter. "Your target, should you accept this mission..."
If you’ve left the good captain alive, then you’ll have to contend with a different set of Republic infiltrators boarding the Black Talon. Sergeant Boran and his three cohorts are intent to get on-board the BT and stop you from making progression to the Brentaal Star. Boran and his group aren’t anything special, just Republic soldiers following orders and trying to be heroic. They pretty much end up sacrificing themselves attempting to stop you from reaching your target. After dealing with the would-be saboteurs, you head back to the bridge to be threatened by Satele Shan. She says you must stop or more Republic forces will show up and destroy you and your friends. I don’t know about you, but I call it a threat. A threat that’s never followed through on and makes the Jedi appear weaker in the eyes of the Sith. If the tables were turned, don’t you agree that an Imperial fleet would have shown up to deal with the intruders? Once you make it over to the Brentaal Star via shuttle, you get to encounter more Republic forces and face off against the water-loving Mon Calamari, Commander Ghulil. This encounter is a prime example of how well the Mon Cals are re-interpreted in SWTOR as more physical, active combatants, rather than the typical star cruiser crew members as seen in Return of the Jedi. This Mon Cal has attitude too and wants to take you down for boarding his ship. If you get past him and then the next boss, which is an optional Droid boss, you are right into the heart of the Flashpoint… A step away from capturing your target. But there’s one catch – A Jedi stands in your way. Yadira Ban, a young Twi’lek Jedi, stands between you and success. For being only a padawan, Yadira is in command of the forces guarding passengers on the Brentaal Star. Don’t be fooled by this one. Although she’s only a padawan, Yadira can put up a fight. Once she’s out of the way, you can move on to your target, the General. "The General, the naysayer to all-out war." The General is a defector from the Empire to the Republic. This man is an idealist, wanting the conflict to end between the two factions. He’s totally against the build-up of weapons by both sides, especially super weapons. But what is Star Wars without the threat of a super weapon outright destroying a planet? 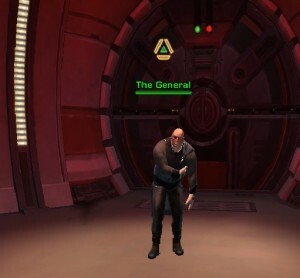 Ok, General So-and-So! Take away our super weapons! But you’re going to explain to BioWare why they don’t have a Star Wars game no more! Whether you kill him or take him prisoner, you’ve finished the Flashpoint and saved the day for the Empire. Personally, I flash back to Lord Vader killing those who failed to serve him in an appropriate manner. I had to quote the movie in party chat – “Apology accepted, Captain Needa.” Timed just right with the on-screen Force-choke and my chat screen was filled with “LMAO” and “ROLF”. Needless to say, you either serve the Empire or you cease to breathe. Time to head on to the capital world of Dromund Kaas. While there’s not a lot of backstory to go along with the Black Talon Flashpoint, it does do a good job of introducing new players to instanced content, while immersing them in the Star Wars universe even more. The elements of the movies are there in the form of Lightsabers, droids, lots of blaster-fire, and bold action by the heroes to save the day. It gives a good view of how ruthless Imperial ideology can be and if you choose to play the bad guy, the way is paved to be the galaxy’s new dark monster.